The phenomenal growth of gaming has inspired plenty of hand-wringing since its inception--from the press, politicians, parents, and everyone else concerned with its effect on our brains, bodies, and hearts. But what if games could be good, not only for individuals but for the world? In Power Play, Asi Burak and Laura Parker explore how video games are now pioneering innovative social change around the world. 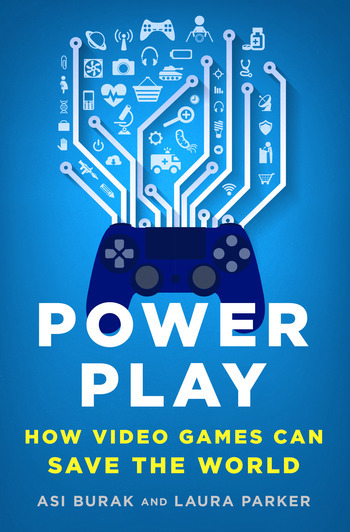 Power Play looks to the future of games as a global movement. Asi Burak and Laura Parker profile the luminaries behind some of the movement's most iconic games, including former Supreme Court judge Sandra Day O’Connor and Pulitzer-Prize winning authors Nicholas Kristof and Sheryl WuDunn. They also explore the promise of virtual reality to address social and political issues with unprecedented immersion, and see what the next generation of game makers have in store for the future. ASI BURAK was named one of the “Digital 25: Leaders in Emerging Entertainment” by the Producers Guild of America (PGA) and Variety Magazine for his work with Games for Change. He co-founded and led Impact Games, the creators of the acclaimed PeaceMaker and Play the News. LAURA PARKER is a journalist who writes about video games and technology for publications including The New York Times, The New Yorker, and Vanity Fair.